How to backup iPhone files to MacBook Pro? I'm going to switch from my iPhone 6 to iPhone SE, any idea of how to backup iPhone 6 files (video, movie, photos etc.) to Mac? I have MacBook Pro running El Capitan. - from Apple Discussion. Get a new iPhone and need to back up the old iPhone files to Mac? It's easy, iPhone file backup software can deal with it. There you go, MacX MediaTrans, a professional iPhone file manager software, can act as the ideal iPhone backup software to completely backup iPhone file to Mac as well as copy iPod/iPad to Mac. It is fully compatible with all generations of iPhone (X/8/7/6s/6/Plus), iPod, iPad Pro/Air/Mini 4. With this iPhone to Mac file backup software, you can easily backup iPhone files like music, video, picture, movies and TV show to Mac with merely a few clicks. The guide below will show you how to backup iPhone to Mac fast without data loss. 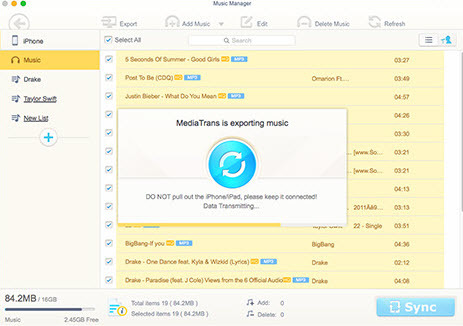 Follow the guide step by step to backup music, video, picture and other files to Mac with the help of MacX MediaTrans. The guide includes three parts: how to backup iPhone music to Mac, how to backup movie/video from iPhone to Mac, how to backup picture from iPhone to Mac. Step 1: Free download iPhone to Mac file backup software and run it. Connect the iPhone to Mac via USB cable. This iPhone to Mac transfer will automatically detect the iPhone, display all the contents of iPhone as a list. Step 2 Select the "Music Manager" button to get the music list. Then choose the music you would like to backup from iPhone to Mac and drag it and drop on your Mac, and transfer music from iPhone to Mac. When your iPhone is connected, you can directly drag the items under Movie, TV shows category to Mac or export it by clicking the "Export" button on top left corner of the interface and start to transfer video from iPhone to Mac. After connecting iPhone to Mac, you will see there is Picture category in the left region of the program, click "Picture" and then all your pictures in "Picture Library" will be listed. Now you can backup photos from iPhone to Mac by clicking "Export" button or simplely do this by dragging and dropping. MacX iPhone Mounter comes up with the date which allows you to mount iPhone as a hard disk drive, so you can copy files like video, audio, images, etc from Mac to iPhone, iPod, iPad. And it also allows you to explore and manage your iPhone contents.